You’ve seen this story a hundred different times in a hundred different ways; hell, in the early 2000s they put out a new version of it every year with the Saw franchise. Escape Room trades the guts and gore of that franchise for safer puzzles and bloodless deaths, but manages to keep the tension mounting throughout its clever set pieces. It never succumbs to the perils of being a lame PG-13 horror movie despite a soggy start, which it gives it an edge, but the film corners itself into a finale that can never be as satisfying as everything before it. 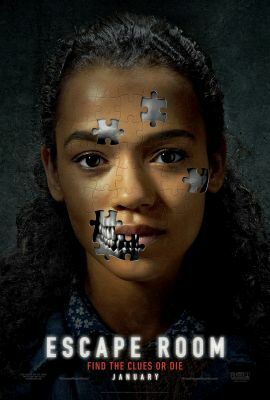 Taylor Russell leads the cast of strangers-caught-in-various-traps as Zoey, a booksmart survivor that just needs a push out of her shell. The group of six come to a non-descript building for the promise of winning cash and naturally find themselves at death’s door thanks to elaborate and impossible trap rooms. It’s a premise that has been stretched to its breaking point, and though the film doesn’t try anything new for its plot, it does manage to never be boring, which would be a cardinal sin. The heavy lifting of the ensemble is done by Daredevil‘s Deborah Ann Woll and Tucker and Dale Versus Evil‘s Tyler Labine, who bring grounded performances to a film that has characters that are so simple. Rounding out the cast of puzzle solvers are Logan Miller, Jay Ellis, and Nik Dodani; who all bring at least a few good laughs to a movie that allows you to catch your breath only a few times. The wheel isn’t reinvented here but it speaks to the power of the core group that they make it fun to watch that wheel keep spinning. As with so many other horror movies, it feels the same. Be it Cube or Saw or The Collector, this isn’t a premise that will feel entirely new. It has the bones of countless franchises at its core, but what keeps the movie alive and interesting is the visual style director Adam Robitel (Insidious: The Last Key) brings to the film. At no point are the events on screen dull to look at, in fact the sequences are so well paced that the running time simply flies by; keeping you on the edge of your seat wondering how they’ll solve the escape rooms, how they’ll beat the traps, and what the next one could possibly be. There’s a frenetic movement as well to what happens, delivering a sense of claustrophobia in rooms that otherwise look like the sound stages they were filmed on, it’s a testament to the camera work and editing that we feel as trapped as the characters. Though the movie begins in a mundane way, it finds its footing eventually and delivers a fun enough time. Then the ending arrives. Like a movie forgotten in time from the year 2005, Escape Room grinds to a halt with its third act. Sticking the landing is so critical in horror that it’s possible to sour the entire experience beforehad if bobbled. Escape Room doesn’t completely fall on its face, but after spending most of its time with new and exciting ideas for its “traps,” it just takes every expected right turn afterward. A film this fun to watch shouldn’t be so frustrating to watch close. All in all there’s nothing offensive about the movie for thrill-seekers looking for a 90 minute escape. Though its plot is as recycled as plastic, it manages to flip and twist itself into places that remain entertaining for most of its run time. The biggest surprise about Escape Room is that it has taken this long to develop a horror film around the cultural craze, and the least surprising thing is that we can probably expect Escape Room 2: The Second Story in about a year’s time.